- This episode is another reconning slipup in which a character says "years" instead of "yahren." - Socialators are in fact officially considered "honorable professions" and have had "the blessing of the elders for over 4000 years." 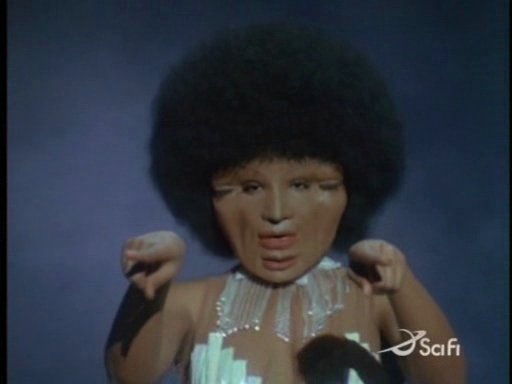 The woman who objected to Cassiopia in part 1 is depicted as a minority in this episode. - This is the first episode to feature the term "micron" in BSG. - This is the first episode to feature the term "centon" in BSG. - This is the first episode to feature the term "feldercarb" in BSG. - Apollo tells Boxey that the Cylons were created by aliens "thousands of yahrens ago." The race which created the Cylons were actually the original race called Cylons, and were a reptilian species. - Colonial officer gives rank insignia to someone count 1. Apollo gives his rank insignia to Boxey. - Boomer and Apollo discovering the gluttons living in luxury while other people in the RTF are starving. - Apollo barging in on the quorum of 12 and proposing his radical idea. - Apollo's subsequent argument with Adama. - Athena steam burning Starbuck. - Apollo, Starbuck, and Boomer minesweeping blind. - The Cylon Imperious leader betraying Baltar. The episode started out as a fine sequel to its predecessor. Right at the beginning they tackle the issue of hoarding and greed becoming a problem in the RTF, which is done realistically and interestingly. Then they move on to the flight plan. We already know Adama wants to find Earth. But there are more immediate escape problems. I like how Apollo solves the problem thoroughly to the displeasure of his father. Their argument was well done and and ensuing minesweeping was one of the most exciting scenes of the whole series. Unfortunately, the good in the episode largely ends there. Because once they pass the minefield, the episode degenerates into something out of a bad Star Trek episode. This isn't to say I don't like bad Star Trek episodes; I love them! But come on people. The colonials have just had their homes completely destroyed. So now they go to a casino planet, build robotic daggits, and pursue romance? Only the tidbits and details of the latter half of this episode are redeeming. We find out where the Cylons came from and we discover that the colonial galaxy is filled with various aliens. This is all very interesting, but this episode is largely in violation of the spirit of the premise. We're examining the nature of the human condition after a catastrophic event of proportions unparalleled in times past. The show should take itself more seriously. We do get some interesting lines here and there, especially during Adama's and Apollo's arguing. And I did like how Boomer sort of bitched about Starbuck enjoying himself at the Casino. But they were almost complete throw away lines. The mood of the episode was undoubtedly cheerful. I don't recall much cheering after the Holocaust. Do you?